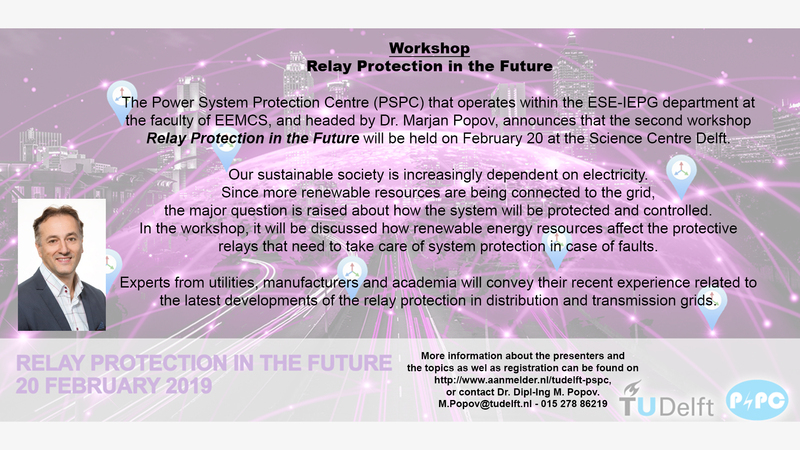 The Power System Protection Centre (PSPC) that operates within the ESE-IEPG department at the faculty of EEMCS, and headed by Dr. Marjan Popov, announces that the second workshop Relay Protection in the Future will be held on February 20 at the Science Centre Delft. Our sustainable society is increasingly dependent on electricity. Since more renewable resources are being connected to the grid, the major question is raised about how the system will be protected and controlled. In the workshop, it will be discussed how renewable energy resources affect the protective relays that need to take care of system protection in case of faults. Experts from utilities, manufacturers and academia will convey their recent experience related to the latest developments of the relay protection in distribution and transmission grids. More information about the presenters and the topics as wel as registration can be found on www.aanmelder.nl/tudelft-pspc, or contact Dr. Dipl-Ing M. Popov via M.Popov@tudelft.nl or 015 278 86219.